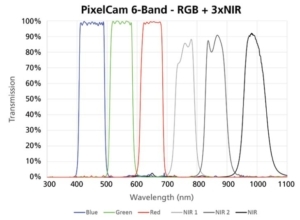 PixelCam™ multispectral cameras provide live imaging of 3-9 spectral bands, off-the shelf or custom, at video rates. Simultaneous multi-channel “snapshot” acquisition delivers rich, real-time data without scene change or pixel shift. 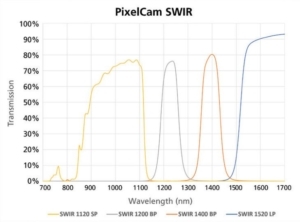 Custom dichroic filter arrays are integrated into the focal plane array at wafer-level to create robust linear and area sensors that extract high contrast spectral information at specific visible and infrared wavelengths. 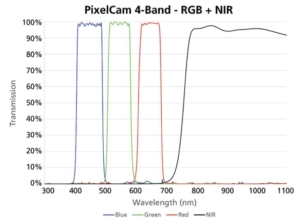 This breakthrough technology enables easy integration into handheld, mobile and aerial cameras – all with the same frame rate, size, weight and power consumption as monochrome cameras.